Open Day at John Taylor & Co. The Ypres bells in their Frame will be on display - one attraction among many! No need to book, just go along! The last branch practice held at Uppingham was very well supported and many who attended felt they had an opportunity to stretch their abilities and pick up some useful tips and skills in the process. Personally, I am very heartened by the fact that these practices and being more supported and its a pleasure to see new (and old) faces come and take part. The next practice is this coming Tuesday 1st August at Oakham, where will be continue to ring the usual Plain Bob (Triples and Major) methods, Rounds and Call Changes and....by request Little Bob Major. So I would encourage you all to study your Diagrams (or those of modern technology ilk..iAgrams /Methodology) and get some valuable revision time in. August represents Quarter Peal (QP) month! There are a number of ringers who have progressed so well over their first year of ringing they are ready to ring a quarter peal (in my view). The first (and easiest) QP is to ring the tenor to a QP of Bob Doubles – “donging behind”. This provides the confidence to ring as part of a team, consistently and in time for 45 minutes. It is a great moment when the conductor calls “that’s all” and the task is completed. The next stage is to ring the treble to a QP of doubles or minor. This is plain hunting for the duration with the coursing order changing slightly when the conductor calls “bob” or “single”. The treble is always unaffected. The final step is ringing inside and thus affected by the bobs and singles. You will have rung short “touches” at practices so you will know what to do. We will arrange a competent team around you and this will ensure a good tempo and so allow you to concentrate on the method not what others are doing to upset you! So all we need is volunteers. Volunteer to your tower captain or ringing master now and we can ensure you are well drilled and ready for your QP in August. The Charmborough Ring attracted lots of interest at Ryhall’s fete, and we hope that that will translate into some new ringers. This remains to be seen, as there were a number of visitors who were from outside the area, in addition to quite a few children, who would be too young to try tower bells. However, there are certainly a couple of potential learners there to be followed up! Being so small and light, a very different technique was needed, but once we got used to the ‘one-handed’ approach (left hand doing backstroke and right hand doing handstroke), and the faster speed, we were then able to ring a few methods. The team who came with the bells were superb - punctual, efficient, and hugely helpful throughout the day. Do consider hiring the ring for future events. A little bit of interest has now been created, which can be built upon. It wasn’t cheap, but was, I think, well worth the effort and expense. Thanks to all who came and assisted at any point during the day. Jane – in teaching mode! Paul, Jonathan and I roamed across the county and sometimes beyond as our confidence in this new skill improved. Paul became chairman of the Rutland Branch of bellringers for several years and was regularly ringing quarter peals and the occasional peal. I think one of his most memorable peals was for the new millennium here in Whissendine. Although other interests came along for all of us, Paul remained a close family friend and we spent many a convivial hour putting the world to rights over a cup of coffee! By this time our ringing was less frequent and mostly here in Whissendine. Life dealt Paul several knocks along the way but he always seemed to take them in his stride. But the cruellest knock of all was the the diagnosis he received in May of this year when he was warned that he had only weeks to live. Here, in Whissendine, the ringers and many, many other friends have, over the summer, beaten a path to Paul’s house to reminisce with him and say goodbye to a well-loved, kind and gentle man. Paul died peacefully at home on 17th July with his daughters at his side. We all mourn his passing but take some comfort from the fact that he is no longer suffering. Our condolences go to his children, Toby, Ruth and Anna, their partners Becky, Jeremy and Tom and Paul’s grandchildren Same, Joe and Ellyn. He was so proud of them all and loved them dearly. Rest in peace, my dear, dear friend. After a private cremation at Grantham Crematorium, a service will be held at Whissendine at 12 noon on Monday August 7th. Ringing in Whissendine has been somewhat intermittent over the last few years as our numbers have dwindled. However, we have agreed that our tribute to Paul’s work as our tower captain should be to try to resurrect the ringing here. To this end, we have decided that we will hold a regular practice on the fourth Thursday of each month. We do though need help and support! All ringers will be welcome to come along! Many congratulations to Helen for embracing the challenge and achieving a big milestone in your bell ringing. Well Done!!! The Uppingham simulator has proved its worth this year – a great credit to John Webster, who set it up, and, with Alan Wordie, started a Saturday morning training session for beginners. Uppingham shoppers are now spared the intermittent bonging of new recruits. Regular sessions started in January, and up till now, 11 beginners, of whom 4 are juniors, have taken their first steps on the bell ringing road. Alan Ellis carried on the good work when Alan Wordie had to take a break, and both Louis Totaro, Richard Beadman and Bob Williams have helped with the teaching too. Sue Webster and I give background support, and Sue’s son Mark has given valuable help with the computer. As time has gone on, 3 of the learners have been able to help with the computer and also do the grovelling needed to fix the silencers on the clappers. 3 of the adult learners are now ringing rounds and call changes in the towers they have chosen to join and are taking first steps into Plain Hunt. One of them is a regular Sunday ringer and raises and lowers in peal (just about, like the rest of us!). One of the teen-agers just came to improve, and was already ringing for Sundays, and the other two are ringing rounds without a minder and beginning to learn raising a bell, and changing places. The other junior (not yet a teen-ager) decided to wait till she was a little older though she really enjoyed the sessions she had. Of course, not everyone started at the beginning, and regular attendance has been difficult for the workers of this world, so the other 4 are at various stages of handling the rope that seems to have a mind of its own. BUT they are all so enthusiastic and determined to get there. Various experienced ringers have acted as mentors for individual learners, and this is invaluable when each learner steps into the wide ringing world. The mentors have come to the sessions, given their encouragement and formed a support team for ringing rounds. It has to be said that the mentors learn quite a lot too, because we can all brush up on our technique! Finally, many thanks to the teachers, mentors and supporters, and a pat on the back for the learners, who, we hope, will all be members before the next AGM. Welcome to Brian Newman, who arrived in Caldecott on 3rd July and by the end of the week had been introduced to towers in the Lyddington Benefice, Uppingham and Great Easton; as he has been ringing since his teens he was greeted enthusiastically. Winslow in Buckinghamshire’s loss is our gain. We hope that with him and another new recruit some regular ringing at Caldecott will be possible. At 10am on Saturday August 12th, a band of ringers from Peterborough will be ringing a peal at All Hallows Church, Seaton, to commemorate the death of Corporal Fredrick Herbert Northern, exactly 100 years before. Fred was fatally injured at Glencorse Wood on 11 August 1917 during the Third Battle of Ypres, or Passchendaele. He died the following day, August 12th 1917, in No. 44 Casualty Clearing Station, two weeks before his 26th birthday. Second Lieutenant H R Hooper, Platoon Commander, who was wounded on 31 July wrote: "It will be some consolation to know that his life was not thrown away, for our battalion attacked and captured very valuable ground in one of the worst parts of the line under very difficult circumstances. I never wish to have a better or braver man in my platoon, and if he had been spared he would have become sergeant, or taken a commission." Fred and his brother George, who was killed 17 months previously are remembered on Seaton's war memorial. The Northern brothers came from Thorpe by Water, where members of the Northern family still live. There will be a practise at North Luffenham on Tuesday, 15th August, at 7.30pm. Every one welcome, as usual. August can be a funny old month for ringing, as a number of towers in and around the county do not have a practise night. We do, so please come along and support us. Regular practices are to recommence at Whissendine on a monthly basis. Ringing will be on every fourth Thursday each month. All are welcome to join us. Homework - Yes, it is necessary! I was recently asked by a ringer why we should make the effort to learn different methods if we don't ever get the opportunity to ring them! I cannot stress that in the busy lifestyles we all now have, we seem to have 'lost' time. We must all try to fit it as little as 10 minutes each day / or an hour each week to do some homework. Look at a method you want to have a go at, try to understand how it works, identify what makes sense and what appears to be confusing (it might be most of it!!!!!!). Make some notes for yourself and try to copy out the line of the method repeatedly. By copying it you are effectively programming your brain to remember the pattern, which will help (in time) when you come to ring it. Don't ever be afraid to ask a more experienced ringer for help or an explanation of something you don't understand. As ringing is a team event, each and every person will only develop if we all as a team learn a method together and ring it. Unfortunately, I hear all too often apologies for 'not having the time to look at anything' or 'I don't know it because I haven't looked at it when I was asked to'. We were all learners once! You only really learn a method truly by ringing it and the more you do it, the better at it you'll become. JUST EMBRACE IT. It just takes time,patience and some help. Some homework as well will help you learn all that little bit faster. It is also the responsibility for the more experienced ringers amongst us to learn methods as well or else we won't be able to extend our repertoire or help those learners who are looking to us for guidance. I’m also seeking volunteers that would like to take part in the Striking Competition Team for Rutland? It is really important that we try to support this event as part of the Guild as we haven't done so for a few years now. My plan is to ring Plain Bob Triples/Major as long as we have the personnel to attempt it. In January Rutland Branch collected £769.00 and this was donated towards the target of £195,000 required to cast 8 new bells, construct the frame and wheels, design a sound control system, commission a peal of hand bells and arrange the hanging of church bells by October 2017. At the time is seemed a tall order but bell ringers throughout the country have raised funds in support and the letter below from Alan Regin updates the position with 2 months to project completion. An entry in the Church Memorial Book in Dedication to the 640 residents of Rutland who died at various battles during the First World War is being prepared and below is an example of the wonderful writing and detail being undertaken in the Memorial Book ready for the Dedication Service on 22 October. 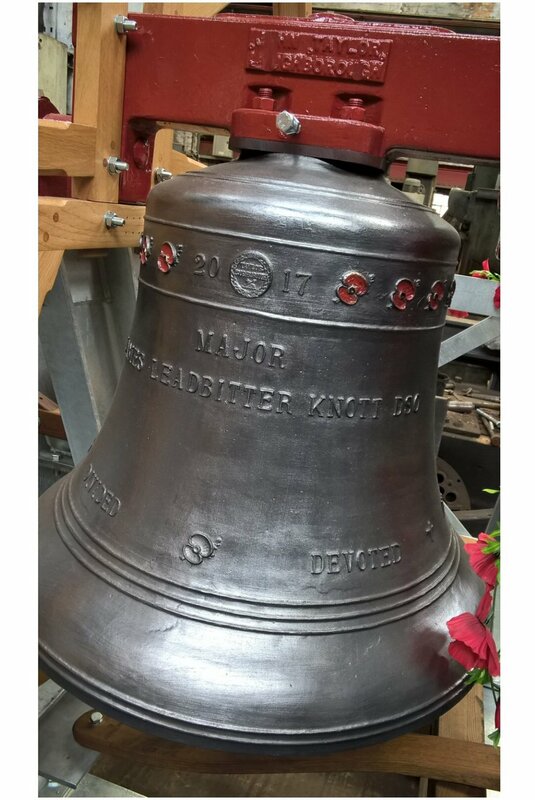 On Saturday 29 July Taylors of Loughborough are holding an Open Day and the Ypres Bells will be on show, so if you have a spare morning why not visit the foundry (open 10.30am - 5.00pm). Dear Bells4StGeogeYpres Supporter, I hope this message finds you and finds you well. All 8 bells have been cast at the foundry of John Taylor & Co. in Loughborough and are currently being tuned. All 8 bell wheels made by David Town of Northallerton have been completed and have been delivered to Loughborough. Major parts of the Sound Control System have been installed by Ian Staves of Northallerton and David Gardner of Ainderby Steeple. We have been working with Mick Angrave of Sapcote and Glyn Pears of Hinckley who have agreed to install the paneling in the tower - this work is being coordinated with the hanging of the bells. The Bells will be delivered to St George's Memorial Church using two lorries that saw service during the Great War, a Thornycroft and a Dennis, both originally built in 1915 - they will be delivering the bells the last few miles and will travel to Belgium on a low loader lorry provided and driven by Mr. Stuart Ritchie of E&N Ritchie. The transport between Loughborough and Ypres via Dorset is being sponsored by The Great Dorset Steam Fair - we are most grateful for this support. It is anticipated that a Civic send-off ceremony will take place at the Loughborough War Memorial Tower in Queens Park, Loughborough - Exact timings to be confirmed! 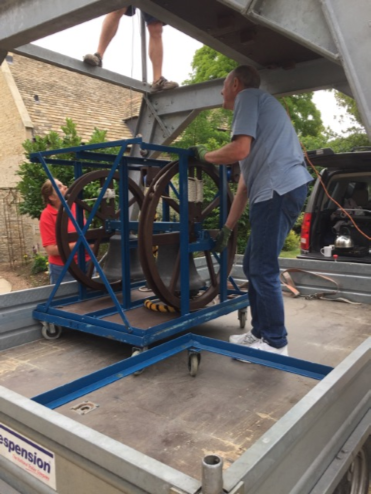 The Ypres bells will be on display with the Thornycroft and Dennis Lorries that will deliver them to Ypres in a special WWI Centenary area. The Bells will be in Belgium and will travel from the Tyne Cot Cemetery to the Menin Gate on the Thornycroft & Dennis lorries to be present at the Last Post Ceremony at 8.00pm that evening. The Bells will travel to St George's Memorial Church on the Thornycroft &Dennis lorries via Ypres Reservoir Cemetery and Main Square, the Grote Markt, before arriving at the Church, exact timings are to be confirmed. At 5.00pm a special service will be held in St George's Memorial Church where the bells will be dedicated on the floor of the Church - this will be a very special occasion. There will be a reception to follow in the Church Hall. The work to hang the bells in the tower will start after this date. The bells will be dedicated in the tower at a special service which will start at 11.00am - again, this will be a very special occasion. There will be a reception to follow in the Church Hall. Have a think about attending one or more of the events - if you are travelling to Ypres you will likely need to book travel / accommodation and, in due course, we will need to know numbers but this is effectively a "heads up" so you can get dates in the diary.